The 65th Miss World 2015 will be held on the 19th of December at the Beauty Crown Grand Theatre in Sanya, China! “We warmly welcome the Miss World family to our forever tropical paradise – Sanya, China. The Beauty Crown Complex offers a breathtaking combination of stunning architecture, luxurious accommodation, exquisite cuisine, and world-class entertainment. What better way to celebrate our 65th year,” said Miss World Chairman & CEO, Julia Morley. The pageant finals will take place in the Beauty Crown Grand Theatre, which was built especially for Miss World in 2003 when the Miss World Final was held in China for the very first time. Five Miss World winners have been crowned there before and Reigning Miss World Rolene Strauss will have the honor of crowning Sanya’s 6th Miss World. 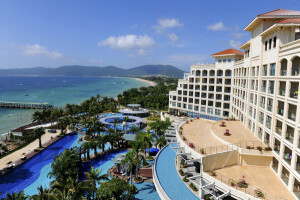 Sanya is located on Hainan Island on the South coast of China. Known as the tropical gateway to China, it boasts an exotic landscape as well as some of the most preserved and beautiful beaches in all of China. The world landmark building Beauty Crown Hotel Complex consists of nine ‘holy trees’, and the participation of some of the world’s top design and construction companies made this masterpiece a distinguished palace with incredible fine arts. www.sunnysanya.com is a travel agency based on Hainan Island with 11 years history in inbound tour services. With our successful experiences in events in Sanya including Volvo Ocean Race Sanya Stopover, we are delighted to offer the hotel booking and transfer services to all families coming to Miss World 2015 Sanya.